Does Bullitt still matter? Fifty years since it came out, is the detective thriller—oozing with Steve McQueen’s quiet, simmering brand of cool and famous for its groundbreaking centerpiece car chase scene—relevant to the young buyers the Ford Mustang once had a monopoly on? After a hot lap of San Francisco in the 2019 Ford Mustang Bullitt, I’m pretty sure it doesn’t matter, because this car is an instant classic in its own right. 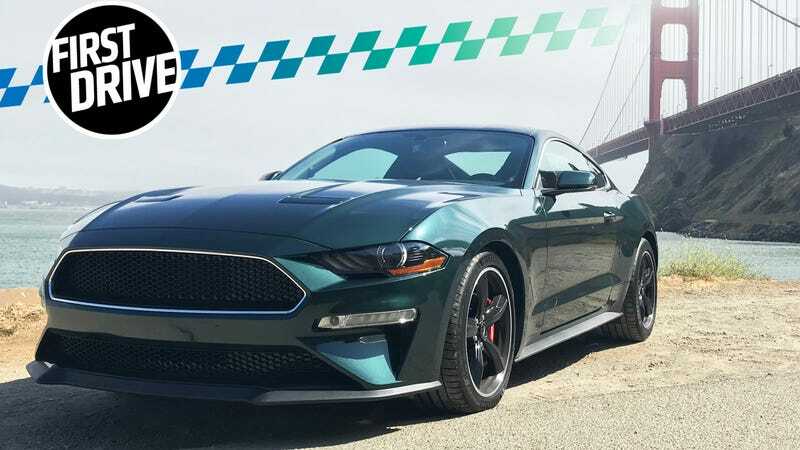 For the third time, Ford is back with a special edition Mustang GT inspired by the green Mustang that Lt. Frank Bullitt uses to chase down bad guys in the namesake movie. It’s an appearance and performance package for the 2019 Mustang GT, which last year got its first big update since the current model dropped four years ago. In addition to coming in one of the most delightful shades of green America has to offer, the new Mustang Bullitt offers one of the best upgrades you can get for a stock Mustang GT, and that alone should make it worth considering. Of course Ford did the launch in San Francisco. Where the hell else could this be done? The movie, the car and the city are all so closely intertwined thanks to the fact that it was shot on-location—a rarity in its time—that it couldn’t have happened anywhere else. The car we tested drove the city drew a ton of cell phone cameras. It’s a crowd-pleaser, especially there. The car happens to coincide with the 50th anniversary of the movie’s release, and it’s a film that can be a tough sell today. As an action movie and a car movie, it lacks the relentless intensity of what we’ve come to expect from that genre. Around our office alone, Bullitt is one of the most contentious topics that can enter conversation. Some of us love it; some of us think it’s trash. I grew up watching it thanks to a my dad, who’s a big McQueen fan (like most Boomer men, probably) and I actually enjoy it for what it is. And I especially love the 10-minute chase scene, which, despite some comical editing errors—the Dodge Charger loses eight hubcaps, you do the math there—it has this visceral pre-digital, pre-CGI realness that makes it jaw-dropping to watch even today. But we’re not here for film criticism. We’re here to see if this Bullitt is a crass marketing exercise, or if it’s one of the better Mustangs you can buy. Opt for the Bullitt version of the Mustang GT and you get 480 horsepower and 420 lb-ft of torque from the naturally aspirated 5.0-liter V8. That’s up 20 HP from a regular Mustang GT, though torque remains the same. The engine here uses the intake manifold and throttle bodies from the Shelby GT350. Ford claims a top speed of 163 mph, and while the automaker doesn’t put out official zero to 60 mph times, we know it does that dash in under four seconds—supercar territory not that long ago. The Bullitt Mustang comes only in V8 GT Fastback form and only with a six-speed manual transmission, topped with a white cue ball shift knob, of course. If you want this package with the new 10-speed automatic, convertible or the EcoBoost turbo four-cylinder engine, you’re out of luck. I’d say sorry but I don’t actually feel bad for you. There are other goodies here too, including an active valve performance exhaust system so it’s louder than your standard GT, Brembo brakes with red calipers, chrome accents around the door windows, a black grille that loses the pony logo, 19-inch five spoke wheels, Bullitt badges inside and on the rear trunk and leather seats with green stitching. You can have it in any color you want, as long as it’s black or Dark Highland Green. Get the green. Green sports cars make you look classy and interesting. I don’t know why you’d want this one in black. Options are minimal here, but they can include Recaro seats you don’t want, a MagneRide adjustable magnetic suspension you will want, and an electronics package that includes memory seats and mirrors, a better sound system and blind spot detection. You could think of the Bullitt as kind of like the Ford Mustang take on the Porsche 911 GTS or 718 GTS—a lot of stuff you actually want, and in some cases would pay a lot more to add yourself. “No jumps, please,” the Ford reps told us before we set off. Apparently some locals had even called the police when they saw one or several Mustang Bullitts doing the McQueen thing in their neighborhoods, perhaps a bit too vigorously. But why call the cops? Some people just have no respect for history. Anyway, we’ll start with how it looks. I’ll call it: this shade of green and Velocity Blue on the regular GT are the best current Mustang colors. Dark Highland Green is a subtly cool color that reveals different shades based on how you look at it. The total Bullitt ensemble—with the dark wheels and green paint and the front badge delete—is clean and understated, just retro enough for you to get what it is. I will say the badges on the rear and steering wheel may be a bit much for some. The Coyote 5.0 V8 under that long hood is a real gem, and truly refreshing to experience in our current era of turbocharged everything. A perfect combination of old-school American muscle and modern tech, it makes this Mustang quick enough to outpace damn near every other car you’re likely to encounter on your daily commute. It had less low-end grunt than I expected—the sweet spot here is in the middle of the powerband, between 4,000 and 6,000 rpm—but it sings all the way to its 7,500 rpm redline. It’s fast, but manageable and never truly overwhelming. I think those people who keep crashing into crowds are really trying to do it. Other nice modern touches to this machine are the Bullitt-standard 12-inch digital instrument cluster, which is fully programmable and just generally looks badass, and the adjustable drive modes, which include the ability to tweak the steering. I see no reason to keep it anything but Sport or Track modes. And it almost goes without saying, but the Brembo brakes are outstanding. Be glad Ford didn’t water this one down with an automatic. The six-speed is wonderful, with short, crisp, tight shifts, almost feeling like an aftermarket unit. Clutch uptake is a bit on the high side, which made navigating San Francisco’s steep hills extra fun, but it’s a very rewarding transmission setup. The real killer app for me, however, was the sound. A Ford guy I talked to said that they engineered the decibel levels on the 2019 Mustangs to be “on the upper end of the legal limits,” and I believe it. The V8 and the active exhaust together growl fiercely at idle and make a thrilling, deeply satisfying wail under acceleration. I never got tired of it. In this car, you constantly scan the road for moments to open it up, not just to drive fast but to hear it. Beyond all specs and tangible things, the Bullitt just feels cool. Driving this car around the city that made it an icon, and across the Golden Gate Bridge, was a downright special experience, even to this jaded and cynical old blog editor. But at the end of the day, it’s a Mustang GT. A very good Mustang GT, but just that. The Bullitt’s strengths and weaknesses all stem from this fact. Take the interior, for example. While the digital cluster is super impressive, and the Bullitt has a few other tweaks to make it a bit more upscale than the last fun rental car you splurged for, you’re still in a really nice version of a car that starts at $26,000. Hard, cheap-feeling plastic abounds on places like the dash and center console. The Chevrolet Camaro probably does the interior thing better than the current Mustang, but at least you can see out of the Mustang. You also do not need to spring for the Recaro seats. I personally despise the Recaros in all the performance Fords, including Fiesta ST and Focus ST and RS. They’re so tightly bolstered with such narrow backs that I don’t really know whose body type they’re for. Stick with the standard leather seats. They have plenty of bolstering and are far more comfortable. Our drive took us through some of Northern California’s most winding forest and mountain roads, and even with its newfound love for the independent rear suspension, those kinds of roads still aren’t the Mustang’s natural habitat. A lot of this just comes down to size—it’s a relatively large coupe—and its 3,705-pound curb weight. The suspension is excellent, however, and MagneRide keeps things comfortable and smooth no matter how hard you’re hooning it. In general I had more fun on the highways and just cruising around San Francisco than I did on the twisty roads. The Bullitt starts at $47,590, more than $12,000 over a base GT and $7,000 over a more loaded GT Premium. Options are few since it comes so well-equipped from the outset, but some of them will get the price tag a bit over $50,000. It’s not exactly cheap, but it is one of the cheapest ways I know to get 480 HP and zero to 60 under four seconds from the factory. In that way it’s a hell of a deal. The car I like best in this price range is the BMW M2, and most of those are closer to $60,000 new, and with a lot less power than this—albeit with better handling. Like I said earlier, it’s a Mustang, just a very good one. If you like Mustangs, you’ll probably be very interested in this one. If you don’t care for them, it won’t change your mind. It never made me see the face of God the way the Shelby GT350 does, and it probably won’t make you a born-again McQueen fan if you thought Bullitt itself was an overrated slog of a movie. But it’s a very compelling and exciting package, one that further elevates the already outstanding current-generation Mustang. It proves just how excellent this car has become over the past few years alone. If I were buying a Mustang GT, this is the one I would want to get, and the V8 noise, great shifter and shade of green would never fail to make me happy. Any time it made me feel like Frank Bullitt would just be an added bonus.